An issue challenging virtual reality we discovered many years ago was the effect that motion sickness had on headset based VR. We realised that we were constantly facing restrictions on the kinds of experiences we could create due to the fact that a lack of real body movement and lower image refresh rates were making users feel disorientated, dizzy or sick when they were using the headsets. This is why, (numerous nauseating trials later) we have been able to build and launch our own range of ‘anti sickness’ or EEVR (enhanced environment virtual reality) chairs which combat the two main contributors to VR based motion sickness. Before we explain how exactly our chairs help combat motion sickness, it is important to understand exactly what is causing these feelings in the first place. We came to the conclusion that there were two main triggers causing sickness in our users – these were what is called technology based motion sickness and emotional based motion sickness. When we turn our head swiftly we have millions of years of genetic experience creating instant visual perceptions of our surroundings. However, in previous years VR has faced issues with latency where the hardware could not materialise the virtual surroundings fast enough to effectively simulate what the eyes would see if the virtual experience was real. Due to this, technologies now aim to counteract any disorientation caused by visual latency by maintaining higher refresh rates (the number of times the visual image is recalculated based on the user’s exact position) of over 60 frames per second, using low latency screens (the pixel fade time is now very short when using OLED technology) and using high accuracy internal and external rotation tracking. 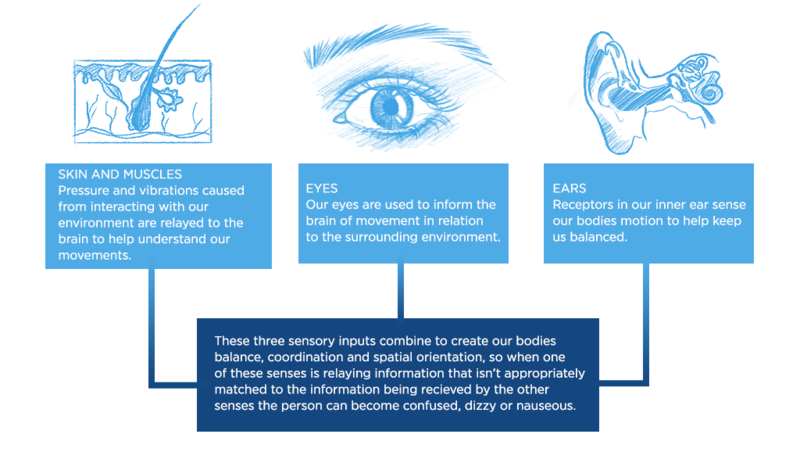 Emotion based motion sickness is when the input from the body’s sensory organs that make up the vestibular system become de-synchronised with one another. For example, in the back of a car the visual environment can often look like it doesn’t move as we reduce our view of the outside World and focus on the inside of the car. The conflict causing motion sickness arises when our other sensory inputs – our skin, muscles and inner ear feel the movement of the car but this does not corroborate the eyes sense of movement. In virtual reality, we have few problems if the visual perspective is stationary and objects move around the environment with our head movements. However, if the user were to move in the virtual environment we are immediately creating a motion conflict and potential sensation of nausea and distraction. 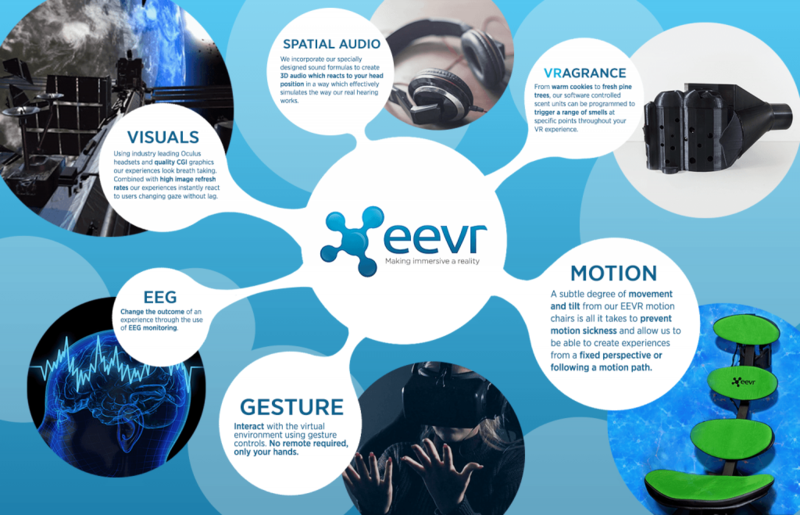 Our EEVR chairs use a suggestive motion algorithm to trigger the bodies response to eye movement (and more specifically directional velocity) which re-align the senses. This has allowed us to create exciting and involved VR experiences based on fixed or dynamic motion paths for several companies. The movement tilt is less than 10 degrees at maximum but is enough to allow for effective and safe sensations that can even involve 360 degree rotations in the virtual environment with minimal disorientation. This, in combination with higher refresh rates on visuals dramatically lessen the the issues users had previously been facing whilst using fully immersive VR. Read about two of our available EEVR experiences, Zen VR and The Limit here.